Top: The Church of Scientology's new 380,000 square-foot religious services center sets the architectural trend for other new downtown area developments. 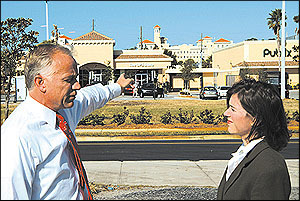 Above: As White Development Company's Jim White explained to Church Downtown Relations Director and Clearwater Main Street committee member Lisa Mansell, "I told my Harbor Oaks Shopping Center acrhitects to refer to the Fort Harrison, the Church of Scientology's new building, and Peace Memorial Baptist Church [next to the Fort Harrison] in designing the shopping center." 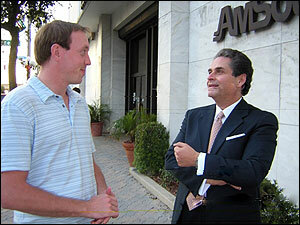 Below: Developer Elias Jafif (right) talks Clearwater Business with media consultant Keith Stone at Jafif's newly-purchased AmSouth property, where his plans for nearly the entire block include new entertainment, retail and residential facilities. For the past five years the groundwork has been laid for what is now happening in downtown Clearwater. While the city of Clearwater’s downtown projects, including the new main library and future streetscape and signage improvements, are moving ahead, other property owners are taking up the challenge too. For nearly three decades, since its arrival in Clearwater in 1975, the Church of Scientology has been engaged in redeveloping and renovating their own properties. Now the largest downtown property taxpayer, (paying nearly $500,000 in 2002 alone), the Church has completed major renovations over the years, including the upgrades of the Fort Harrison Hotel, the Sandcastle Hotel, the Clearwater Bank Building, the Coachman Building, three motor inns along North Fort Harrison, and most recently, the Osceola Inn. A second, more extensive renovation of the landmark Fort Harrison Hotel is now underway, which will return the hotel to its original splendor of the 1920’s, and also house two new restaurants and a conference center available for community events. The Church’s current project is the construction of a new, seven-story, 380,000 square foot religious delivery center, connected to the historic hotel by a sky bridge across Fort Harrison Avenue. In keeping with the Mediterranean architectural style of the hotel, the new building will have a large gallery, open to the public, with informational displays depicting the basic tenets of the Scientology religion. Meanwhile, others have begun to put their own plans into action to create a downtown that will house new residents and bring additional retail and other businesses newly to the area. The result is a growing consensus that the downtown neighborhood will not only be a source of community pride but prosperity. The increased tax base is an additional benefit for all of Clearwater that, say the Chetkins, cannot be overstated. A typical downtown redevelopment project is the Weisman Building, also on the corner of Cleveland and Fort Harrison. Before its renovation, this property supported a single retail establishment that employed less than five employees. The vacant second floor was home to only a flock of pigeons. In the past six years the Weisman premises have been completely renovated, its appraised property value doubling in the process. More importantly, an underutilized downtown historical landmark is now home both to an international development concern and one of the most successful Starbucks coffee shops in Florida, as well — and that adds up to more than five times the number of employees working in the building. The Wiseman Building has proven a most successful starting point for Main Street community progress. Today seven different downtown Clearwater residential and mixed-use retail/office residential projects are either in the early planning stages or under construction. An overview of the projects shows they cater to all socio-economic groups. "New residents become patrons of local businesses and allow those same businesses to employ and retain staff, which again increases both demand and service availability for everyone in the community." The Laura Street town home project, located a block north of Cleveland on Laura, was the first of its kind to break ground in downtown. Now nearing completion, its 18 units create a neighborhood unto themselves, but within walking distance of the downtown retail core. At the other end of downtown are the BayView Condominiums, currently under construction at 700 Osceola Avenue. Twenty-eight upscale condominiums are replacing a worn-down apartment building. Though 28 families will soon be able to call BayView home, its impact on the area goes further than its rooms with a view. Dotting the landscape between these two developments are a number of other projects to create additional residences, office space, parking and conference facilities. These include Mediterranean Village, which is currently under construction just east of Myrtle Avenue downtown and a high-rise mixed-use project near Station Square Park. Looking to the future, there is the re-development of the Colliers Arnold property on Drew and Osceola into a mixed use retail, residential, hotel and conference facility. Next door to that is the AmSouth Bank property on Cleveland Street, which was recently purchased and is now being studied to discern its redevelopment potential as a mixed-use project. Not only are larger developers looking to change the face of downtown, but smaller-scale property owners, like Len and Emmy Chetkin, are also stepping up to the plate. Having recently purchased the original People’s Bank Building on Cleveland and Fort Harrison, the Chetkins see an acceleration of change today in downtown Clearwater that approximates Key West’s 20 years ago. They envision apartments on the second floor with a restaurant and ice cream shop on the ground floor of the old bank location. They are currently working on the architectural plans for the building and will then begin to renovate the property, including fixing the clock that has been a downtown landmark since the 1930’s. In the next five years downtown Clearwater’s skyline will dramatically transform, say both developers and city planners. Wiser utilization of properties and wider availability of retail, residential and parking are just some of the benefits. And with a larger property tax base and revenue from increased sales tax in the area, residents can look forward to a safer, more industrious and aesthetic climate — all hallmarks of a downtown that everyone in the city can be proud to call home. Thanks to the foresight and creative spirit of the Len and Emmy Chetkins and others like them in both the public and private sector, the heart that is downtown Clearwater once again beats robust as a lively hub of creativity, commerce and culture. If you are interested in assisting in the rebirth and rejuvination of downtown Clearwater, there are opportunities to make good use of enthusiasm. Please contact Anne Fogarty, Main Street Coordinator at (727) 564-4044.